The intensity of mental disorders is particularly worrying in the adolescents. Half of all mental illness starts by the age of 14, but most cases go undetected and untreated. Suicide is the second leading cause of death among 15-29-year-olds. The pathetic state of mental health care in the country coupled with government’s apathy is a cause of great concern. A plausible reason is the sheer scale of the problem. Hence, nobody wants to discuss the elephant in the room. However, the nation cannot afford to ignore the stark reality. There are only about 43 mental hospitals in the country, and most of them are in disarray. Six states, mainly in the northern and eastern regions with a combined population of 56 million people, do not have a single mental hospital. Most government-run mental hospitals lack essential infrastructure, treatment facilities and have a sickening ambience. Visiting private clinics and sustaining the treatment, which is usually a long, drawn-out affair, is an expensive proposition for most families. The consequences of not addressing adolescent mental health conditions extend to adulthood, impairing both physical and mental health and limiting opportunities to lead fulfilling lives as adults. Mental health promotion and prevention are key to helping adolescents thrive. According to a Ministry of Health and Family Welfare report, India faces a treatment gap of 50-70 percent for mental health care. The government data highlights the dismal number of mental healthcare professionals in India; 3,800 psychiatrists and just 898 clinical psychologists. A large number of them are situated in urban areas. WHO reports that there are only three psychiatrists per million people in India, while in other Commonwealth countries, the ratio is 5.6 psychiatrists for the same. By this estimate, India is short of 66,200 psychiatrists. Mental health care accounts for 0.16 percent of the total Union Health Budget, which is less than that of Bangladesh, which spends 0.44 percent. A developed nation’s expenditure on the same amounts to an average of 4 percent. India must find better ways to parlay its impressive economic growth into faster progress in this critical area as maintaining an ignorant stance on the issue will not help in its resolve. A survey conducted by the All-India Institute of Medical Sciences (AIIMS) in collaboration with WHO across 11 centres in the country, involving 3,000 people from each city found that 95 percent of those with mental-health problems remain deprived of treatment due to stigma, shame and getting shunned from societies. Three age groups are particularly vulnerable to depression: pregnant or post-partum women, the youth and the elderly. With resources tight an effective method for successfully tackling mental illness is a major expansion of online psychiatric resources such as virtual clinics and web-based psychotherapies. The economic consequences of poor mental health are quite significant. The cognitive symptoms of depression like difficulties in concentrating, making decisions and remembering cause significant impairment in work function and productivity. 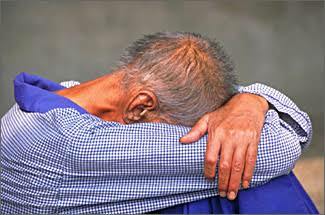 A World Economic Forum-Harvard School of Public Health study estimated that the cumulative global impact of mental disorders in terms of lost economic output will amount to $16.3 trillion between 2011 and 2030. In India, mental illness is estimated to cost $1.03 trillion (22 percent of the economic output) during 2012-2030. Estimates suggest that by 2025,38.1m years of healthy life will be lost to mental illness in India (23% increase). The fact is that poor mental health is just as bad as or maybe even worse than any kind of physical injury. Left untreated, it can lead to debilitating, life-altering conditions. Medical science has progressed enough to be able to cure, or at least control, nearly all of the mental-health problems with a combination of drugs, therapy and community support. Individuals can lead fulfilling and productive lives while performing day-to-day activities such as going to school, raising a family and pursuing a career. Although mental illness is experienced by a significant portion of the population, it is still seen as a taboo. Depression is so deeply stigmatised that people adopt enforced silence and social isolation. In villages, there are dreadful, recorded cases of patients being locked up in homes during the day, being tied to trees or even being flogged to exorcise evil spirits. Stories of extreme barbarity abound in tribal cultures. In some societies, family honour is so paramount that the notion of seeking psychiatric help more regularly is considered to be anathema to them. Recognition and acknowledgement, rather than denial and ignorance are the need of the hour. Many a time, mental-health problems are either looked down upon or trivialised. These man-made barriers deprive people of their dignity. We need to shift the paradigm of how we view and address mental illness at a systemic level. Tragically, support networks for the mentally ill are woefully inadequate. There is an urgent need for an ambience of empathy, awareness and acceptance of these people so that prejudices dissipate and patients are able to overcome the stigma and shame. India’s Mental Health Care Act is a very progressive legislation, and is the equivalent of a bill of rights for people with mental disorders. Fundamentally, the Act treats mental disorders on the same plane -- as physical health problems thus stripping it of all stigmatizations. There have been some encouraging innovations in India, led by voluntary organisations that are both impactful and replicable. Dr Vikram Patel, who is a professor at the London School of Hygiene and Tropical Medicine and co-founder of the Goa-based mental health research non-profit ‘Sangath’, has been at the forefront of community mental health programmes in central India. It deploys health workers, some with no background in mental health. The mission tasks community-based workers to provide low intensity psychosocial interventions and raise mental health awareness and provide “psychological first-aid.” Since they are drawn from the same community, they are able to empathise with the patients. The next stage consists of mental health professionals. The programme uses Primary Health Centres for screening people with mental illnesses. According to Patel, mental-health support workers can be trained at a modest cost. Given the limited availability of mental-health professionals, such first-aid approaches can be suitably and successfully adapted to community needs with limited resources. The senior therapists can be given basic training in general medicine, psychology, psychiatry, psychopharmacology, social work and patient management. His model envisages the involvement of primary care based counsellors and community based workers to reduce the burden of depression in the population. There is no longer any doubt about whether community health workers can be trained and supervised to deliver clinically effective psychosocial interventions. The challenge before us now is how to go beyond pilots and research studies and scale these innovations up in routine health care. Involvement of the social, health and education sectors in comprehensive, integrated, evidence-based programmes for the mental health of young people is vital for strneghtening the overall healthcare framework at the grassroots level. Mental healthcare initiatives are presently focused on a narrow biomedical approach that tends to ignore socio-cultural contexts.Community mental-health services can offer a mix of clinical, psychological and social services to people with severe, moderate and mild mental illnesses. Also, counselling can make a profound difference and build resilience to cope with despair. Providing psychoeducation to the patients’ families can also help. Unfortunately, in recent decades, academic psychologists have largely forsaken psychoanalysis and made themselves over as biologists. There is need for strengthening the cadre of behavioral health therapists. Prevention must begin with people being made aware of the early warning signs and symptoms of mental illness. Parents and teachers can help build life skills of children and adolescents to help them cope with everyday challenges at home and at school. Psychosocial support can be provided in schools and other community settings. Training for health workers to enable them to detect and manage mental health disorders can be put in place, improved or expanded. Such programmes should also cover peers, parents and teachers so that they know how to support their friends, children and students overcome mental stress and neurotic problems. There is a need for more open discussion and dialogue on this subject with the general public, and not just expert’s .this can help create a more inclusive environment for people with mental illness. Lewis Carroll very succinctly summed up the plight of today’s human beings in the conversation between the Queen and Alice in her classic "Alice in Wonderland". Here’s the paraphrase: Alice tells the queen that one has to run at the top of one’s speed to excel in a competitive race. The queen disagrees and we see the essence of competitive existence when she tells Alice that in her country one has to do all the running at the top most speed to retain one’s position. But if you want to get somewhere you have to run twice as fast. This is the paradox. Everyone wants to go somewhere. But they don’t know where. This is the reason for the growing incidence of depression in society. With simple yet effective steps, we can turn the situation around and build a more accommodating environment for those struggling with mental distress.